Perhaps you’ve seen a television ad, a billboard, or a box of red noses sitting on the Walgreen’s counter... Red Nose Day is almost here! But, what is it? The annual event, launched in the United States in 2015, brings people together to have fun and raise money for an important cause: ending child poverty. Since its launch in 2015, Red Nose Day has raised more than $100 million to help more than 8 million children living in poverty in the United States and abroad. How? By empowering donors, like you, to get involved. Keep reading to learn how you can join in! 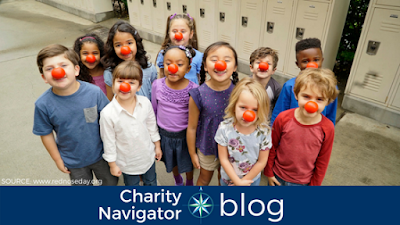 Comic Relief, Inc. the organization behind Red Nose Day shared some fun and easy ways you can get involved in helping them raise funds to end child poverty at home and around the world. These creative ideas are also great ways to raise awareness and fundraise for other organizations or causes you’re interested in. Donning a red nose is key to celebrating Red Nose Day. Get a friend. Put on your noses. And snap a picture of you going “nose to nose.” Donate to the campaign online and share your picture with friends on Facebook, Twitter, or Instagram to challenge them to do the same. Remember the Ice Bucket Challenge? We’ve seen how silly, viral campaigns can help charities raise big money for the important issues. Participating in viral campaigns can be a great way to have fun and show your friends and followers what matters to you. Love to bake? Red Nose Day offers participants the tools they need to start a successful bake sale. Fundraising is always more fun with a cupcake in one hand! A bake sale is a great way to raise money for a cause you’re passionate about. And, it can be a fun way to kids involved in teaching them the value of charitable giving. Can’t bake? No problem! Consider making and selling something else (bracelets, t-shirts, etc. ), holding a car wash, or donating your landscaping services. You might as well match your outfit to your nose on Red Nose Day! It’s a great way to show your family, friends, or coworkers you’re taking part in the event. Most causes have an awareness week or month throughout the year, and often it comes with a color theme. Find your week. Find your color. And show your friends you’ve got a cause! Plus, it’s a great way to get creative with your wardrobe. It’s surprising how your pocket change can add up over time! Make it a habit to empty your pockets into a jar at night and commit to donating the funds to a charity you’re passionate about. Or, share a jar with your family or coworkers. Throw in your spare change after lunch and see how quickly it adds up! The success of Red Nose Day proves what’s possible when people across the country and around the world come together to tackle a problem. If child poverty is your cause, consider one of these fun ways to participate or create your own. And, don’t forget to tune in the Red Nose Day program on Thursday, May 24, on NBC. And, don’t forget you can use these creative ideas to raise awareness and money for any cause! Charity Navigator’s Advanced Search Tool and Discover feature are excellent resources for finding a highly-rated charity to support.